Hiya! Today, I wanted lots of flash and bling, so I did a glitter placement design! Fun fact... those glitters are supposed to be pink. They totally look orange. In my next mani you'll see an orange polish that ends up looking pink. FUNNY COINCIDENCES! I started with a base of Indie Polish Happy Birthday, an awesome silver holo glitter polish. It's not quite opaque in two coats, but I didn't need it to be totally perfect since most of it would be covered up. It's just there so the little bits that peek through between glitter pieces are nice and sparkly too! 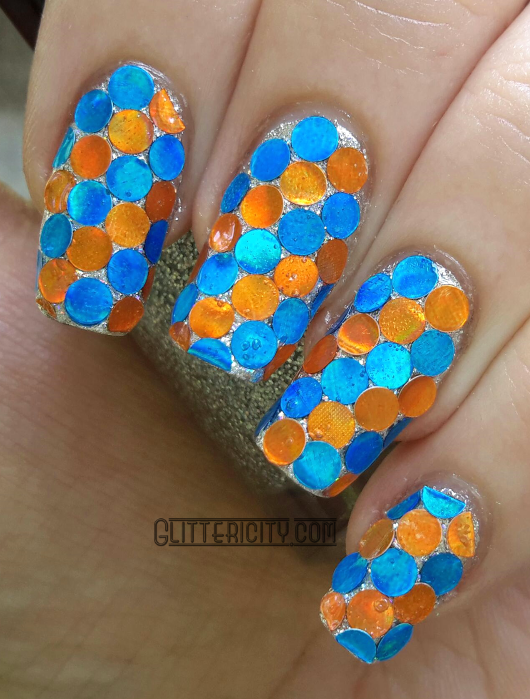 Both sets of round glitters were purchased from a random craft store, years ago. I dunno, go poke around at your local, I guarantee you'll find something ;) the blue ones were called Mermaid and the pink ones are Princess. Because they're pink. A sort of warm salmon-pink, but yeah. 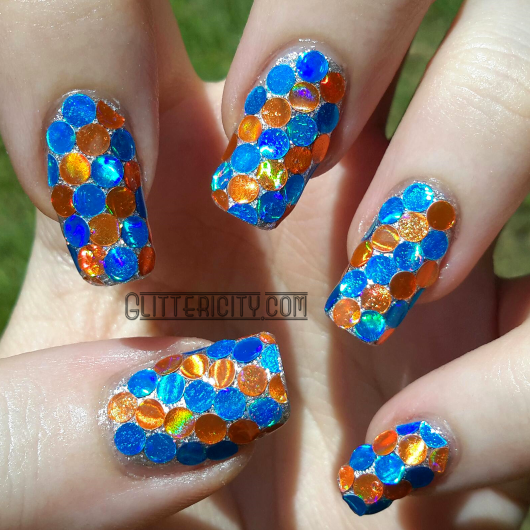 I placed them with lines of topcoat, an orange stick, and a bit of time. Because the glitters are so big, though, it didn't take too very long to complete. Maybe 15-20 minutes :) I think I spent more time cutting glitters in half before I started, so I had some to place around the edges for the best coverage (most noticeable on my smallest finger). I used two or three coats of Seche Vite topcoat to seal them in and smooth it all out. Shiny! I think that's what made them look more orangey, though. 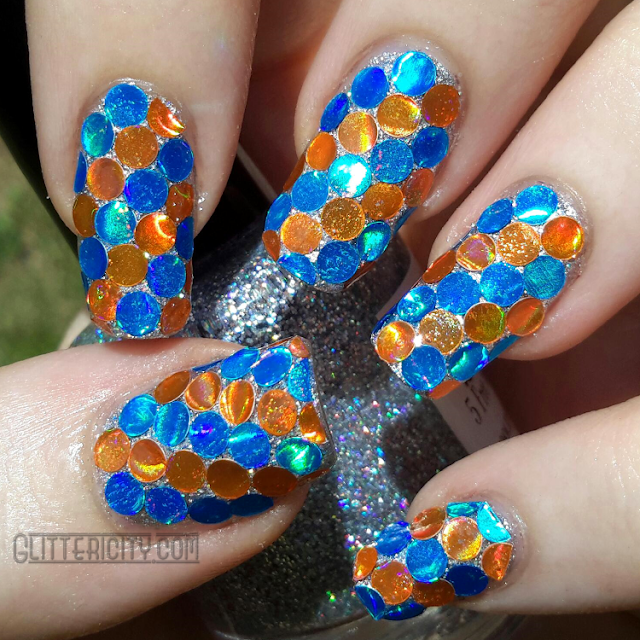 I don't remember this happening in the past, but the glitters are pretty old now and maybe they're reacting with topcoat now... Oh well, I still like the look! definitely the best pic of them :D click to enlarge! 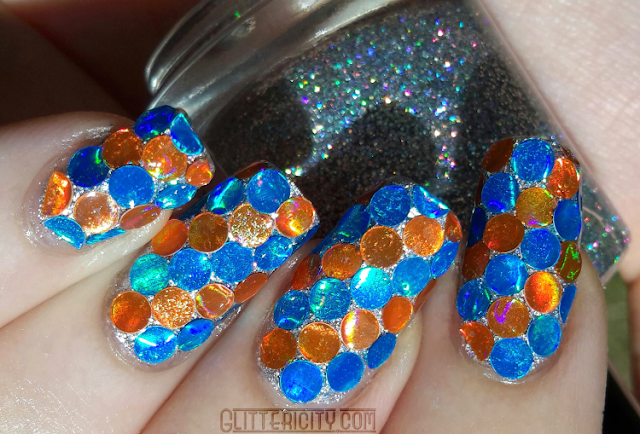 Glitter placement can be such a nice way to relax--and you get a pretty manicure out of it to boot! 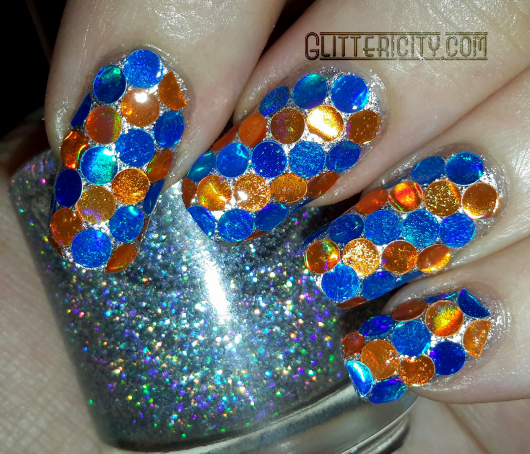 Do you like this bling-tacular look?